Here's a look at things that have happened on Oct. 22. Today is Monday, Oct. 22, the 295th day of 2018. There are 70 days left in the year. On Oct. 22, 1979, the U.S. government allowed the deposed Shah of Iran to travel to New York for medical treatment — a decision that precipitated the Iran hostage crisis. 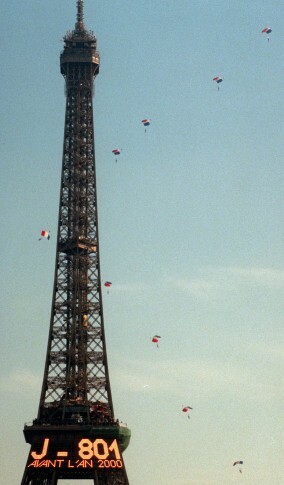 In 1797, French balloonist Andre-Jacques Garnerin (gahr-nayr-AN’) made the first parachute descent, landing safely from a height of about 3,000 feet over Paris. In 1811, composer and piano virtuoso Franz Liszt was born in the Hungarian town of Raiding (RY’-ding) in present-day Austria. In 1928, Republican presidential nominee Herbert Hoover spoke of the “American system of rugged individualism” in a speech at New York’s Madison Square Garden. In 1934, bank robber Charles “Pretty Boy” Floyd was shot to death by federal agents and local police at a farm near East Liverpool, Ohio. In 1962, in a nationally broadcast address, President John F. Kennedy revealed the presence of Soviet-built missile bases under construction in Cuba and announced a quarantine of all offensive military equipment being shipped to the Communist island nation. In 1986, President Reagan signed into law sweeping tax-overhaul legislation. In 1991, the European Community and the European Free Trade Association concluded a landmark accord to create a free trade zone of 19 nations by 1993. In 2001, a second Washington, D.C., postal worker, Joseph P. Curseen, died of inhalation anthrax. In 2014, a gunman shot and killed a soldier standing guard at a war memorial in Ottawa, then stormed the Canadian Parliament before he was shot and killed by the usually ceremonial sergeant-at-arms. Ten years ago: Wall Street tumbled again as investors worried that the global economy was poised to weaken. The major indexes fell more than 4 percent, including the Dow Jones industrial average, which finished with a loss of 514 points. The fishing vessel Katmai sank in the Bering Sea off Alaska’s Aleutian Islands, killing seven crewmen; four survived. India launched its first mission to the moon to redraw maps of the lunar surface. (India lost contact with its lunar satellite Chandrayaan-1 last August.) The Philadelphia Phillies won Game 1 of the World Series, defeating the Tampa Bay Rays 3-2. Five years ago: The United States defended drone strikes targeting al-Qaida operatives and others, rejecting reports by Human Rights Watch and Amnesty International questioning the legality of attacks that the groups asserted had killed or wounded scores of civilians in Yemen and Pakistan. One year ago: The latest allegations of sexual harassment or assault in Hollywood targeted writer and director James Toback; the Los Angeles Times reported that he had been accused of sexual harassment by 38 women. U.S.-backed fighters in Syria captured the country’s largest oil field from the Islamic State group, marking a major advance against the extremists. Japanese Prime Minister Shinzo Abe scored a major victory in national elections that decisively returned his ruling coalition to power.